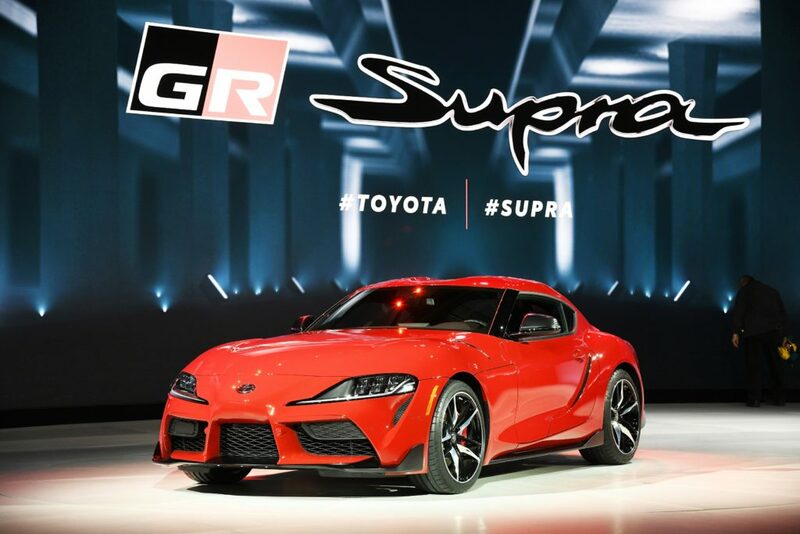 The 2020 Toyota Supra — which the OEM calls first U.S. edition of the sports car in 21 years — will roar onto streets with a mixed-material body design involving a number of aluminum and high-strength steel parts and a rear hatch made from a polypropylene composite. Toyota senior manager for sports cars and crossovers Benjamin Haushalter gave us a rundown of the car following its reveal Jan. 14 at the North American International Auto Show. The 2020 Supra will go on sale in the first half of 2019 with an base MSRP of $49,990, according to Toyota. 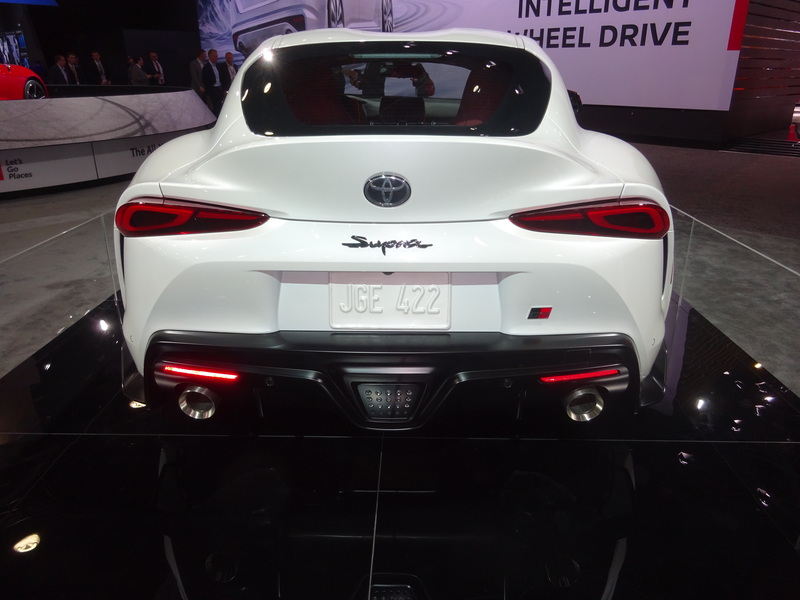 The preliminary curb weight of the 2020 Supra is 3,397 pounds, including the turbo engine with an automatic transmission. “Uncommon for its day, the MKIV (1998 Supra) also featured an aluminum hood, front crossmember, upper control arms, and all sorts of engine bits all in an effort to shave weight,” Automobile magazine wrote in 2015. 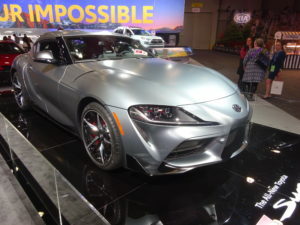 The fifth-generation Supra goes beyond that, with a hood, inner and outer doors and a “big aluminum shear panel” beneath the engine cradle all made from aluminum, according to Haushalter. The car’s “front crash box” — which Haushalter defined as the bumper reinforcement beam and “the structure it bolts on to” — was made of the nonferrous metal as well, he said. Finally, he said the front suspension and some underbody “bracing” parts are all aluminum, as is the engine cradle. The rear suspension is aluminum and steel, according to Toyota. Haushalter said the 2020 Supra also had a number of “high-strength steel” parts throughout the body, in too many areas to mention. We asked if we were correct in assuming Toyota was using more of the higher strengths of steel — the ultra-high-strength-type metal, and he agreed. • The front end has “a prominent central grille section flanked by large air intakes,” according to Toyota. The back of the vehicle finds an integrated spoiler and a “trapezodial rear bumper shape,” the OEM wrote. • A full-color head-up display is available as an option. It’s unclear if it projects upon the window or another surface. • Meet those Toyota specs, for the OEM reports the car “delivers a 50:50 weight balance while optimizing front-to-rear aerodynamic balance.” You’ll have to keep it that way. • The Supra is rear-wheel drive. It has “(h)igh-performance wheel hubs” on the front suspension and larger rear wheels than front wheels, all fitted with performance Michelin Pilot Super Sport tires. • The rearview mirrors can auto-dim, the windshield wipers work with a rain sensor, and a lot of ADAS comes standard or optional. • Heeding whatever calibration and scanning Toyota says is necessary could be crucial beyond just the vehicle’s ADAS. The OEM describes Sport driving and adaptive variable suspension modes and an active differential, for example.